Could Light Therapy Help Your Mom Feel Better This Winter? Every winter, your mom feels down. You get her out of the house as often as possible, but it’s hard with your personal and professional obligations. Despite your efforts, she still seems down. Have you heard about light therapy? Light therapy is often helpful for easing winter blues. Here’s a little more about this therapeutic treatment. The lack of sun is one of the reasons winter blues kick in. It’s colder outside, so your mom isn’t getting out as much. The days are shorter. Snowfall and ice also make it hard to get out and get fresh air. Light therapy involves the use of a light therapy box. This box gives off light that is very similar to sunlight. High-quality light boxes can cost a few hundred dollars, so it is an expense. It can, however, be worthwhile in improving your mom’s mood. If you need a budget model to start, many people with SAD give high praise to models like the Verilux HappyLight Liberty 10,000 LUX. It’s lightweight and stands a little over a foot high, so it’s very portable. Your mom can put it next to her while she watches television or reads a book. She can put it next to her bed to get some light exposure in the middle of the afternoon. Are There Other Ways to Ease Winter Blues? Give your mom something to look forward to each week. If your mom is home alone most days, make Saturday a day out. You or another person can take her shopping, out for a late lunch, and then stay to watch a movie with her. Set up one room in her home to create a sense of tranquility. An aromatherapy diffuser or wax warmer unit, a comfortable chair, and soft music can be very soothing. If she likes taking a bubble bath, keep a supply of her favorite products on hand for a relaxing soak. Make sure your mom has someone around to keep her company. 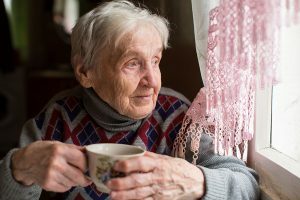 If you, another family member, or a family friend can’t find the time, look into elder care services. Caregivers stop by on days you’ve scheduled and keep your mom company. Plus, caregivers can help with chores your mom finds difficult. If your mom struggles to carry her laundry basket up and down the stairs, a caregiver could come in once a week to change her sheets, do the laundry, and make the bed. If your mom has a hard time cooking meals, caregivers can come each day to prepare healthy meals and dine with her. If you or an aging loved one are considering elder care in Freehold Township, NJ, please contact the caring staff at Lares Home Care 888-492-3538 or 732-566-1112.